Simple, rustic flavours are the name of the game with this beautiful comfort food dish. Courtesy of Bob and Carlene Deutscher of BS' in the Kitchen. 1. In a large pan (preferably heavy cast iron), add enough olive oil to coat the bottom of the pan, and bring to medium-high heat. Once heated, add the pork chop on one side, and your halved baby potatoes on the other. Season everything with salt and pepper. 2. Once pork chop has a good sear on the one side (after about 5-7 minutes), flip it and cook until done (a couple more minutes – or until it reaches and internal temperature of 150°F). 3. Remove pork chop from pan and let rest. 4. 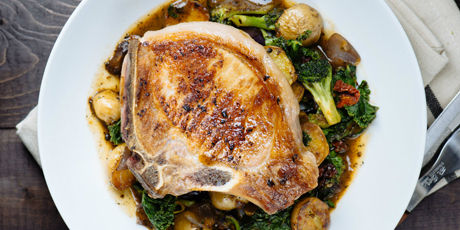 While pork chop is resting, add the broccoli, along with the red onion, garlic, and habanero pepper and an extra drizzle of olive oil, roasting for about 5 minutes, until broccoli and potatoes start to brown. 5. Once browned, add in your kale, a pinch of thyme, and pinch of sage. Mix to combine, then add about a 1/2 cup of stock. Cook until stock has absorbed. 6. Remove potatoes and vegetables from pan. 7. Add 1 Tablespoon of butter, and tablespoon of flour, mixing together. Once flour has absorbed into the butter, and is bubbling, add about a 1/2 cup of stock, mixing until thickened. Add more stock if pan gravy becomes too thick, or cook longer if gravy is too thin. 8. Serve pork with vegetables and pan gravy.